Cancer has largely remained incurable due to its complexity and its ability to spread rapidly and uncontrollably. Sarcoma: Cancer that begins in bone, cartilage, fat, muscle, blood vessels, or other connective or supportive tissue. Leukaemia: Cancer that starts in blood-forming tissue such as the bone marrow and causes large numbers of abnormal blood cells to be produced and enter the blood. The Tumours can be benign or malignant. Benign tumours are not cancerous. They can often be removed, and, in most cases, they do not come back. Cells in benign tumours do not spread to other parts of the body. Malignant tumours are cancerous. Cells in these tumours can invade nearby tissues and spread to other parts of the body. The spread of cancer from one part of the body to another is called metastasis. Ayurveda, being ancient holistic healthcare treatment, renders genuine support for the failing health of the cancer patients, more importantly providing sufficient cure and recovery from the hazardous side-effects of chemotherapy and radiation therapy. These side-effects include nausea and vomiting, weight loss, hair fall, weakness, pains and digestive maladies. Although in case there is lot of ama in the body systems of the cancer patient, he may require purification therapies in accordance with his innate prakruti and vikruti. These Panchakarma detoxification Ayurvedic treatments are great support to reduce the excess ama along with correcting the dosha imbalance. At the same time, these Ayurvedic treatments and detoxification therapies help to recover the depleted ojas thus providing immunity boost. It is believed that by providing through detoxification, prana or the life force energy can flow freely and support the healing process. Other than this Ayurveda offers an array of external oil therapies like Abhyanga and Shirodhara, most of which provide systematic relaxation and rejuvenation to the patient and readily aids in enhancing the immune system. The invigorated and robust Ojas or the resistance power is big support for controlling the growth of the cancer cells. Thus it is recognizable that Ayurveda offers time-tested treatments against cancer. The Ayurvedic treatment mainly starts with change in lifestyle and abstinence from the root cause which can be challenging to follow as the person may have to detach from his favourite food, sedentary lifestyle and long sleeping hours to align in a regulated lifestyle. Factors like tobacco use, alcohol use, unhealthy diet and physical inactivity are some of the prime influences that not only impede healing but also trigger the risk of production of cancer disease. 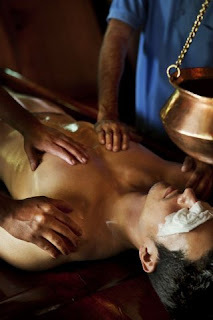 Ayurvedic treatments can be safely combined with chemotherapy and radiotherapy procedures to minimize the side effects. Early detection, early medical or surgical interventions are believed to be the key factors in combating cancer effectively. It needs to be understood that starting with Ayurvedic treatments even as a co-therapy at early stage of the disease yields best possible results. In the classical Ayurvedic literature there are hundreds of herbs listed that may have the potential to heal cancer. They are strongly purifying, healing and detoxifying. Several new plants that are the derived natural products have proved to be of extreme interest in the treatment of cancer. Ashwagandha: A popular Ayurvedic medicinal substance derived from the root and berry of the plant. Studies in laboratories have shown that extracts of ashwagandha kill some cancer cells and enhance some immune cells. Ashwagandha also reduces the level of glutathione, an antioxidant, in tumor cells which may enhance the effects of radiation therapy against those cells. Ginger: Ginger is one of the most potent anti-cancer herbs. Ginger gets its distinct flavour from a compound known as gingerol. This compound has been known to effectively combat breast, ovarian, prostate, and colorectal cancer. Garlic: Garlic has a flavour component that can effectively battle precancerous cells. The use of garlic can prevent formation of compounds that cause cancer. Watch video here. Turmeric: Turmeric contains a compound known as curcumin. This compound has preventive effects on lung, skin, colon, stomach, prostrate, and breast cancer. Triphala: This is one of the popular Ayurvedic herbal formulas prepared from three herbs viz. Amla, Harad and Baheda or the three myrobalans. Triphala is an effective laxative, which also supports the body’s strength, due to its high nutritional value. This herb mixture exclusively cleanses and detoxifies at the deepest organic levels without depleting the body’s reserves. Several other examples of strongly reducing, anti-carcinogenic herbs include red clover, Tulasi, burdock root, Taxol, Manjishtha, dandelion root, guggulu, Shatavri and Chaparral. What is Ayurveda Wellness Mantra?